Win A $3000 Week In Anguilla... 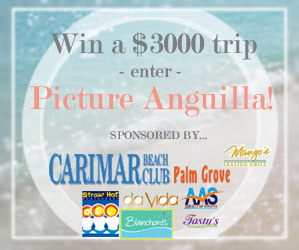 Yes, the "Picture Anguilla" Contest has started! To win, submit your favorite Anguilla photo(s)... the one(s) you enjoy looking at over and over again. This year, the sponsors have been extra-generous! 1) Carimar Beach Club: 6 night/7 day stay (including taxes, service fees, surcharges!). Situated right on the beach at "Magnificent Meads!" 2) Anguilla Air Services: Connecting airfare for 2, to or from St. Maarten. 3) Enjoy a 5-star dinner every day! There you have it, a full luxury week in Anguilla! Visit this page for prize details. How To Play & Win "Picture Anguilla!" The contest is now LIVE! 1) Find your favorite original photo of Anguilla. If you have never been to Anguilla, see further below - you can still play! 3) If you have not yet "Liked" our page, please do. 5) You will be asked to let the contest app access your profile. Click "Go to App" (Wildfire is a large reputable and trusted contest company). 6) Follow the instructions from there! Click here for full instructions. What if you've never been to Anguilla? Don't worry! You can play, too! Find your favorite Anguilla photo(s) on either of the two websites which have the most Anguilla photos. Click here for details. NOTE: Contest Deadline: July 8th at 6PM (Eastern). Enter the "Picture Anguilla! by clicking here! By the way, you can view current entries by visiting this page.